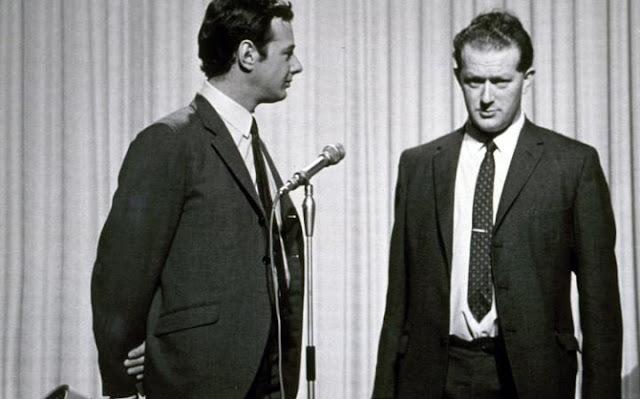 Inner Circle: Brian Epstein with Tony Barrow (Right) in 1965. Anthony FJ "Tony" Barrow has sadly died. He was 80 years old. Barrow was born in Crosby, Liverpool in 1936 and when John and Paul were getting together in one part of Liverpool, Barrow was putting on shows and dances featuring Skiffle and Jazz bands around Crosby. While The Beatles were in Hamburg, Barrow moved down to London to work for Decca records, writing liner notes, which went on the back of an LP. While still contributing to the Liverpool Echo. It was in 1961 when Barrow was contacted by Brian Epstein for some professional advice that Barrow first learned of the Beatles. He arranged for them an audition with Decca records which they infamously rejected. Despite this, Barrow was encouraged by Epstein to work for the Beatles by doubling his salary and from 1962 to 1968, he worked for NEMS Enterprises as their Press Officer, writing the liner notes for their albums. He promoted all the artists on the NEMS roster which by then included Cilla Black, Billy J Kramer and the Dakotas, Gerry and the Pacemakers and the Fourmost. When Beatlemania took off in the UK after their appearance on Sunday Night at the London Palladium, Barrow no longer had to contact the Press about the Beatles, they contacted him. Barrow travelled with the Beatles during their 64, 65 and 66 tours and was present during the 'Summit of the Giants' when they met Elvis Presley. When the Beatles formed Apple in 1968, Barrow was naturally made redundant from his role, he left NEMS Enterprises to set up his own PR company, representing entertainers and musical acts from the Kinks, the Bay City Rollers, the New Seekers and Bob Monkhouse, to American artists, including David Cassidy, Gladys Knight, David Soul, the Monkees, Tony Bennett, the Jackson Five, Andy Williams, and Neil Sedaka, for their European tours. In 1980, he left the PR business and returned to freelance journalism. Of course, his most talked about period in his career was his time with the Beatles and so he wrote two books about it: The Making of the Beatles' Magical Mystery Tour (1999) and John, Paul, George, Ringo and Me: The Real Beatles Story (2006). Barrow attended numerous Beatle conventions talking about his time with the band and participated in numerous documentaries on the band. He died at his home in Morecambe, Lancashire, England, three days after his eightieth birthday.